You might not agree on politics, but you can agree on Bud Light. That's the message of the A-B InBev brand's 60-second Super Bowl spot, unveiled Wednesday. 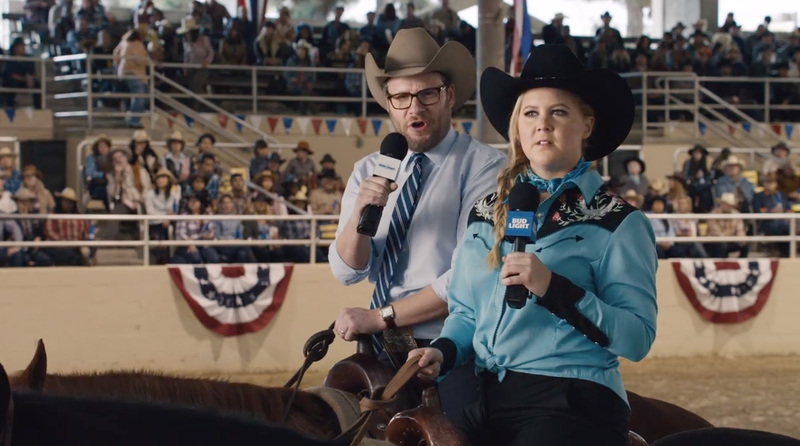 The first work for the brand from Wieden + Kennedy features Amy Schumer and Seth Rogen, the faces of the Bud Light's new brand platform, "The Bud Light Party," which serves as a way for the brand to parody the political season. For the Super Bowl spot, which introduces consumers to this new approach, the duo campaign across the country for Bud Light, popping up at rodeos, bars and even interrupting a Lakers game to lobby for the beer. There are some surprise guests, too. Ah, yes, consumers might not be able to agree on much, but they can agree on beer… and Paul Rudd, of course. Rudd's Ant Man co-star Michael Pena also makes an appearance. "Despite the fact that there are so many things people disagree upon, we believe and we know that there are so many things that people agree upon and Bud Light is one of those," said Bud Light vp Alexander Lambrecht. The spot also features the brand's new package design from design firm Jones Knowles Ritchie. The revamped cans and bottles will be on shelves in April.